Switch is the best place for anyone in year 7 – 12 to hang out on Friday nights. Gates open at 7pm with a cost of only $2 (special events may differ in price)! Check out below what a typical week at Switch Youth could look like! An inspirational time where youth can meet together, worship and hear from God’s word in a relaxed and friendly environment followed by a chill out time with loads of food! A time where you can talk real life. With inspirational key note speakers talking on the challenges of life Couch Sessions are an awesome time to hang out with your mates, enjoy the chill out zone and food along with talking life together. Held throughout the term are exciting and entertaining Friday night social events. 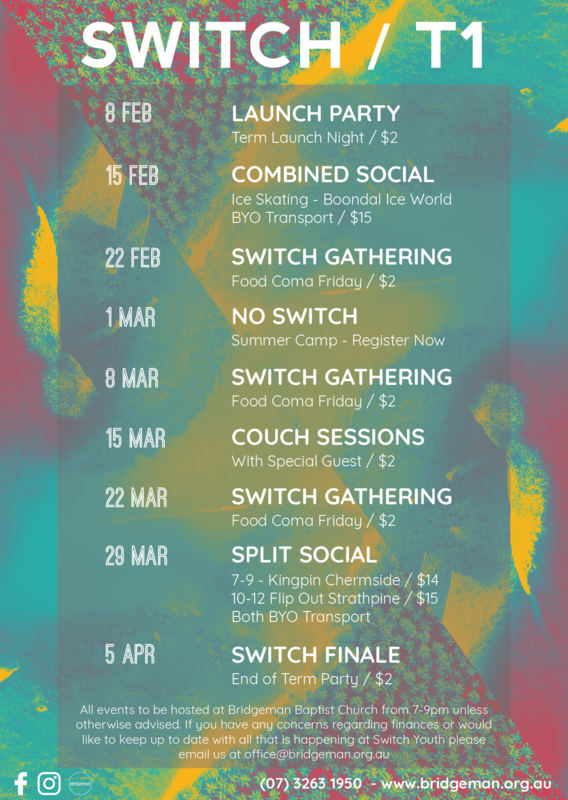 From Ice-Skating to Trampoline Parks to Bonfires and Mega Movies Switch Socials are the best opportunity to invite your mates to show them all the cool stuff happening at Switch Youth! With all that is happening each week make sure you download the info below! Complete the 2019 Switch Information Pack HERE! Click here to view the Term 1 Planner! 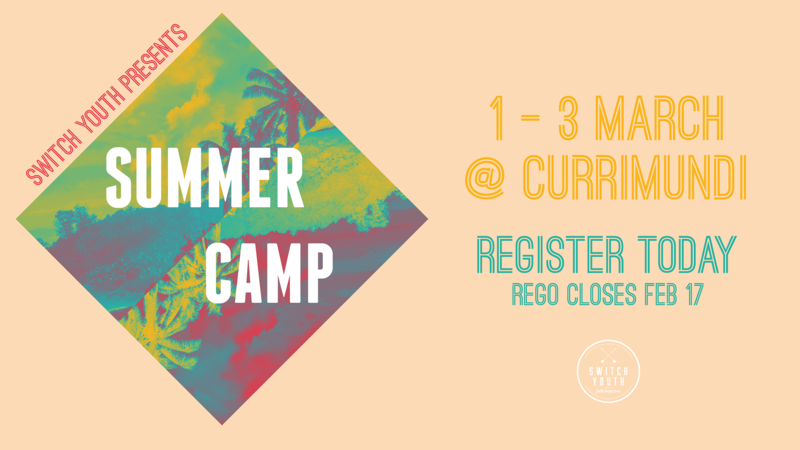 Held annually in March, SWITCH Youth Camp is always a great way to start the year off. SHIFT Youth Festival is a community youth music festival hosted by Bridgeman Baptist, that has been bringing AWESOME bands & PRO Extreme Sports to the North Brisbane suburbs for 10+ HUGE years! Attracting thousands every year, SHIFT is committed to making boring Saturdays history. Get set for SHIFT 2018!! Held during church approximately 30 minutes after commencement of the AM & 4.30pm Sunday Services for those in grades 7 to 10, during school terms. Grades 7 & 8 students participate in discipleship-based classes, whilst students in grades 9 & 10 have the option of taking part in the Leadership Development Year, which provides a selection of activities to choose from, mentoring and ministry experience.